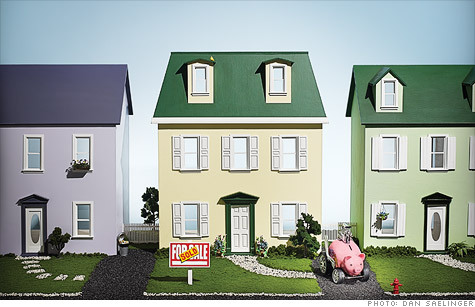 (Money magazine) -- It's an extreme buyer's market -- and home values could fall another 5% by year-end. Here's how to meet the challenge faster, cheaper and better. Underprice the place by 10%. Doing so will be painful, no question. But with cheap foreclosures still flooding real estate markets around the country, listing your home for less than comparable ones in your neighborhood is the best way of unloading it as quickly as possible. By making your home look like a bargain, you'll attract a crowd, says Steve Murray, editor of Real Trends newsletter_ and ideally start a bidding war. Remember: Your listing price is not necessarily your selling price. How much it costs: This strategy may cost you thousands of dollars -- but you'll slash your carrying costs. Go it alone. Doing an FSBO (for sale by owner) isn't for the faint of heart. You'll have to figure out the right price, handle all marketing, run open houses, and haggle with buyers. So go this route only if you have confidence in your sales and negotiating skills. For details and tips from homeowners who've done it, go to fsbo.com. Time it takes: You'll put in dozens of hours, and a sale may take a while. How much it costs: $299 to post your home on a multiple-listing service (peanuts compared with the 6% realtor commission you'll save). Adopt a multi pronged strategy. Use an experienced agent but negotiate the commission: Murray says that many agents these days are willing to drop to 5%, from the standard 6%, if you agree to price your home aggressively and get it in move-in condition yourself. (Hire a home stager to help; find one at realestatestagingassociation.com.) And don't rely on the broker to do all the marketing: Pitch in by using social media such as Facebook to publicize your listing. How much it costs: Home stagers charge $150 to $400 to give recommendations. To find a house fast, go straight to Zillow.com, which lets you tap info on more than 100 million listings in the U.S. To score the best deal, scope out foreclosures (find a broker who specializes in them at realtor.com), which abound in many areas and currently sell for at least 20% to 30% under market value, RealtyTrac reports. Ask a contractor for a free repair-cost estimate before committing. The perfectionist move? Call an exclusive buyer's agent (find one at naeba.org). This pro will do the legwork to find and show you homes that meet your criteria, plus negotiate the lowest price. It's true that he gets paid by the seller, not by you (he splits the commission with the listing agent). But he has a fiduciary duty to put your interests first. Because his reputation is at stake, he's unlikely to screw it up to get a few hundred bucks extra.